This week, we are saying goodbye to some old friends; leeks, beets, and carrots are all making their final appearance on our fresh sheet and farmers market table until this year’s crops grow up. Some of these crops have been with us for a very long time. Leeks are started from seed in February or March, transplanted into the field in May, and harvested starting in late September. We leave all the small leeks in the field over the winter – they are very cold hardy, so we can just walk out to the field to pick leeks for dinner all winter long. Finally, sometime in April or May, the remaining leeks start to make their flowering stalk. This appears first as a thin but tough inner core, which will become a five-foot high flower if left alone. When we see the first signs of this in our overwintered leeks, it’s time to pull them all out of the field. 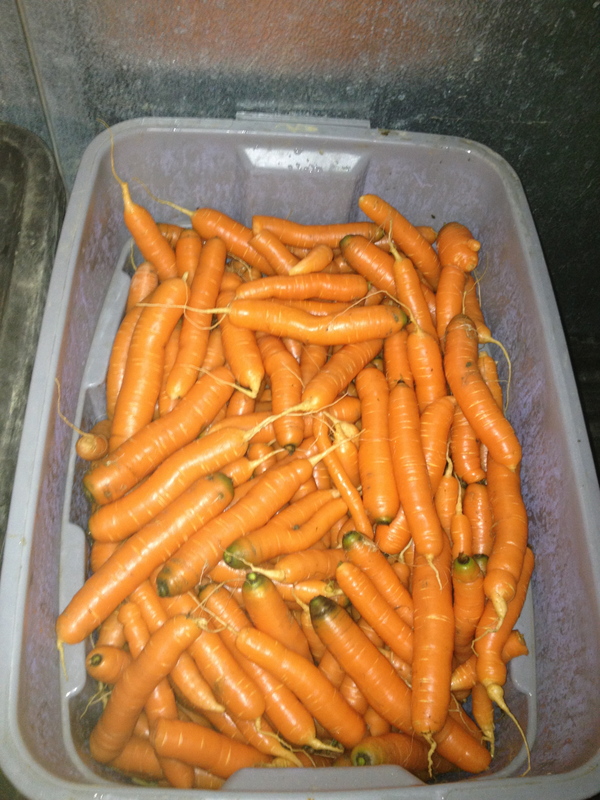 Carrots, parsnips, and beets all have a similar life cycle. At a certain point in the spring, they come out of winter dormancy and start putting all their stored root energy into a flowering stalk – truly their only purpose in life! All the photosynthetic work that these plants do in the first season of their life to grow a big sweet root is ultimately all repurposed to make an attractive flower, get pollinated, and make viable seed to keep their genes in the gene pool. From our point of view, that emerging flower stalk is a sign that the roots are about to get tough and bland, so it’s time to harvest… sorry plants, you won’t be reproducing. Some years, overwintered crops carry through the end of April or even into May. It’s some combination of day length and temperature that must send them into reproductive mode, but I don’t know exactly what does it. This year, the change has come earlier than normal. Maybe it was our mild winter, or the warm spell we had in March, but everything is rapidly trying to go to flower. Luckily, mild winter weather usually means that we have also had a chance to get some of this year’s crops into the ground a little earlier than normal. Yesterday, besides the very last of our Red-Cored Chantenay carrots, we harvested our first spring-sown crops from the field: French Breakfast radishes and tender little mustard greens. These were sown during an exciting little weather window in late February, and have been slowly growing under a protective blanket of floating row cover for almost two months. It’s just a little bit of this and a little bit of that coming from the new plantings at this point, but it will help us through the difficult transition from winter to spring. Our first farmers market is this coming Sunday on Broadway, and we’ll have a diverse array of hearty roots and tender spring items. 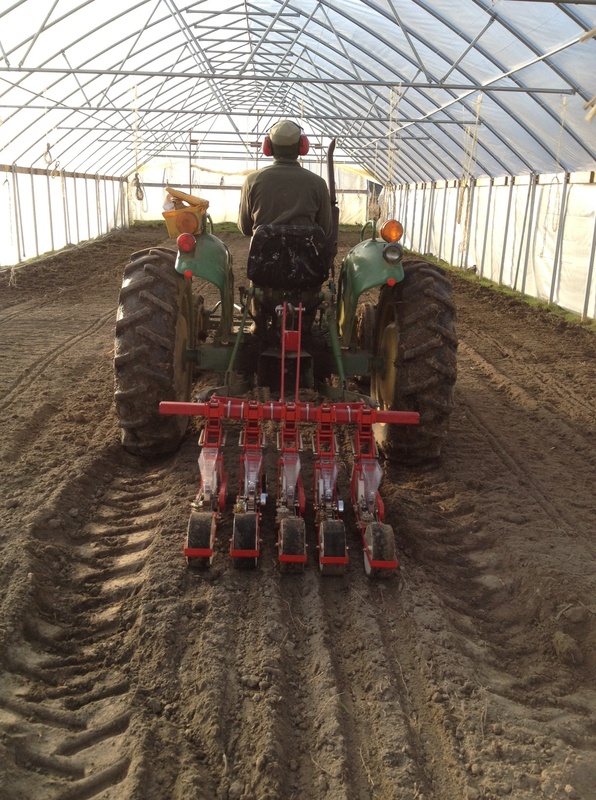 We used our small fleet of greenhouses to good effect this spring, and have already harvested several thousand row-feet of arugula, spinach, and radishes from February greenhouse plantings. For Sunday, we will have baby head lettuce and a little bit of salad greens from our greenhouse plantings to help fill our market table. Sowing radishes in the greenhouse. … and seven weeks later. Soon, these spring greenhouse crops will have to make way for tomatoes, peppers, basil, and eggplants, and we’ll be relying on our hardy outdoor crops to grow, and not get eaten by pests, so we can continue to supply our market and restaurant customers with some form of vegetables. May is the most challenging month of the market season, because those outdoor crops just do not grow that quickly. We transplanted lettuce seedlings into the field couple weeks ago, and in a normal spring we should expect to harvest them not until the beginning of June. Lettuce for eating in June. 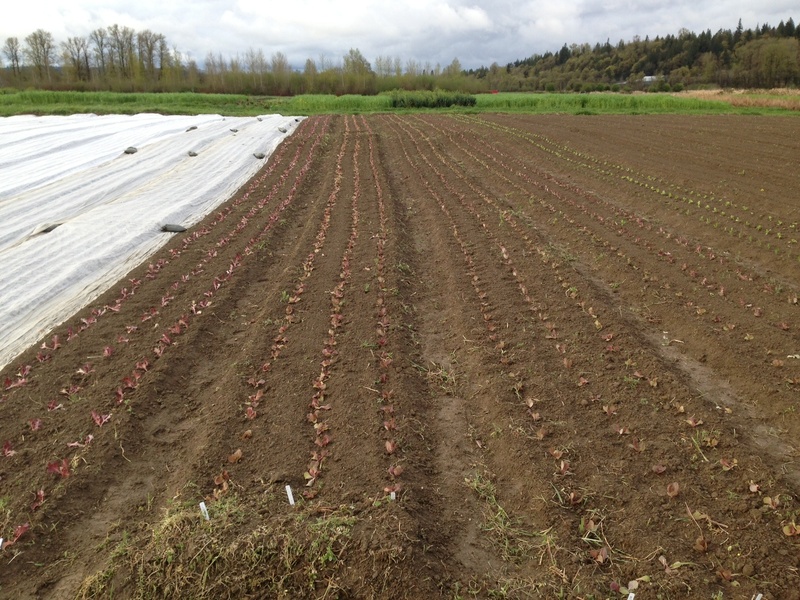 Chard and kale won’t reach pickable size until almost mid June. In May we really rely on our direct-sown, quick growing things: salad greens, bok choi, arugula, radishes, and turnips. This is why a dry spell in late February or March is so important for us! 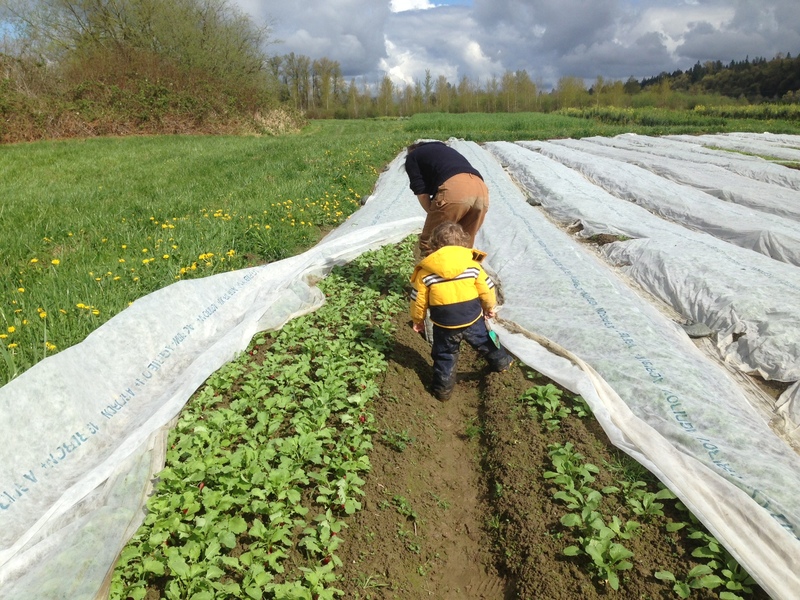 We drop everything and prepare beds so we can plant seeds in the field, tuck them into their little spun fabric blankets, and hope that they don’t get too munched by slugs before they are ready to harvest. Hey there! I’m a Seattle based artist who you often feed (thank you!). That photo of your son(?) 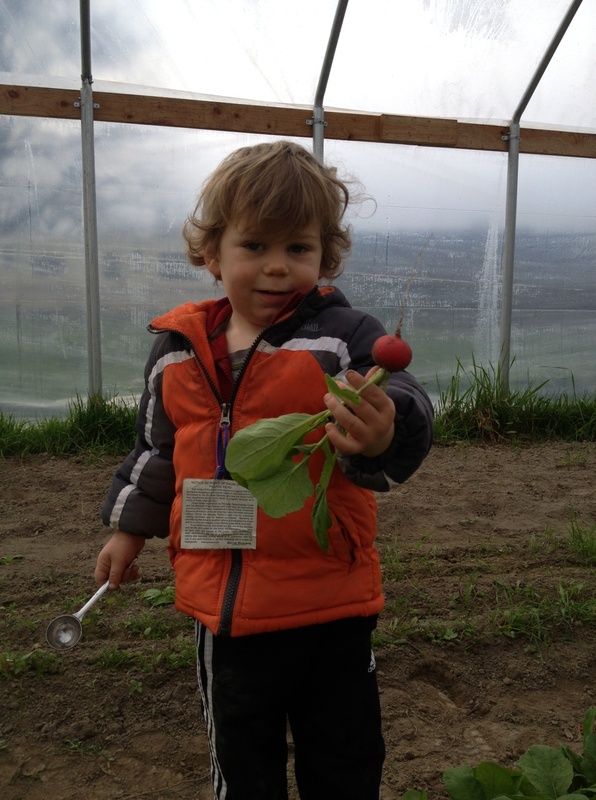 holding the radish is so darn cute I’d love to make a drawing of the photo. May I? Yes! We’d love to see it when it’s done. I also posted the lineart and a colored version on Facebook and tagged you guys. Thank you! Super cute!